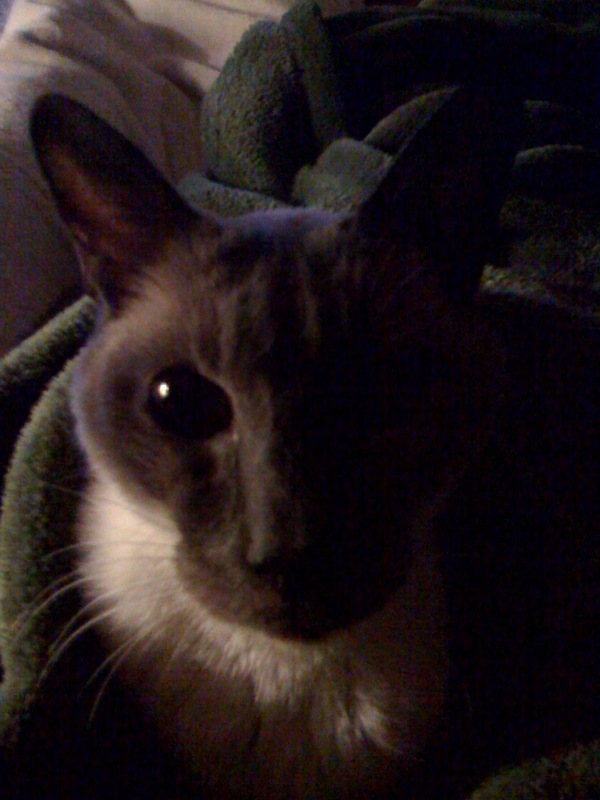 So tonight I took our mouthy little Siamese to the vet for what I thought would be the last time. He’s been sick for awhile. In the past year he has lost about two thirds of his normal weight, going from about 15 pounds to about 5 now. He is usually very active and chatty, but lately he just eats and sleeps. Even by cat standards he is a hyper-groomer, always ready for show, so when he started to get mangy I knew it was not good. We give him as much food as possible, but he’s still losing weight. So I went to the vet with the expectation of not bringing him home. The vet suggested we run a few tests before we give up. He has been on thyroid medications for about a year, but his test showed still elevated thyroid levels. Otherwise his blood tests looked normal. The vet cautiously told me that this does not preclude another issue, such as cancer, but we can try doubling his medication dose and see if he responds over the next week or two. Kwoan came into my home as a rescued stray when I first started dating Jen, almost seven years ago. It took him all of about two minutes to get comfortable in the house, meet my other cat and start his usual mouthiness. We had trouble coming up with a name, a problem with us as Jen’s cat is simply named Kittie and my old cat came pre-named. Ultimately, we gave him the non-name of Kwoan, which stands for Kittie WithOut A Name. I love my pets, but am also realistic about things. When we had our first child we had to send a cat to the shelter, because we simply didn’t have time to keep up with his health issues and non-use of the litter box. I try to keep things in perspective. Children are family members and pets are residents of the household. I never refer to my pets as kids, children, etc. Yes, they bring me joy and are nice companions, but nothing compared to my kids, not even in the same universe. Still, taking our Kwoan out of the house for what may have been the last time was no less fun or heart wrenching. The thought now of having to do this again and having to explain to my four year old daughter again, that Kwoan may not becoming home just tears me up inside. Scottsweep.com is powered by	WordPress 3.9.1 and delivered to you in 1.068 seconds using 28 queries.